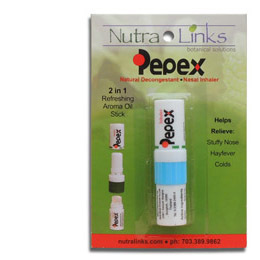 Pepex is a 2 in 1 decongestant and topical balm that contains simple, proven ingredients. Non-addictive, Pepex blends eucalyptus oil, menthol and borneol. One part inhaler, one part roll-on for topical use, all in a small ergonomic package. Color coded so friends and family members can keep them straight! As a Roll On: great for tension headaches, or applied directly to sore, achy muscles as a topical pain reliever . Pepex as a topical is also a great, natural way to treat the sting and itch from insect bites. As an Inhaler: Pepex lets you breathe freely, and helps clear a stuffy, blocked or runny nose, and provides immediate relief for symptoms of colds and allergies including nasal congestion, hay fever and sinusitis. Individually packaged, 6 per carton. For external use only. Avoid direct contact with eyes or mucous membranes. Rinsing your eyes with water will alleviate irritation should Pepex inadvertantly make contact with your eyes. Discontinue the use of the product if mild allergic reactions occur. 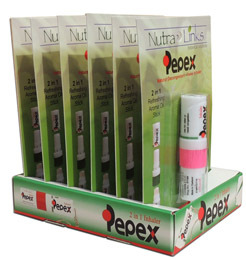 Pepex is not suitable for use on open wounds, sores or sensitive scar tissue. 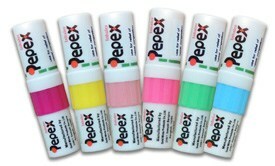 Pepex is not a substitute for conventional medicine but is used as a supplementary product to provide topical relief. Consult your physician if your symptoms persist despite the regular use of Pepex. Hugely popular and proven in southeast Asia for years.